Lee Angol celebrates his goal at Swindon. Photo: Joe Dent/theposh.com. In-form Peterborough United striker Lee Angol wants to improve on his near-perfect scoring record for the club. 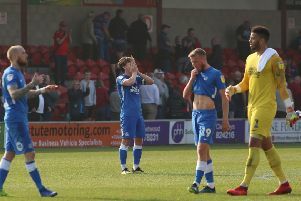 Angol has scored five goals in six matches for Posh since he was handed a Football League debut by then manager Grant McCann at Oldham on September 12. The 21-year-old scored twice in that match with his fifth goal arriving less than a month later in Saturday’s 2-1 League One win at Swindon. It’s a remarkable campaign so far from a player who was farmed out to Boreham Wood on loan by Luton Town last season. He responded with over 30 goals as Boreham won promotion to the National League for the first time. Angol probably won’t ever score an easier goal as he walked the ball into an empty net after a horrible howler from Swindon ‘Keeper Lawrence Vigouroux. He’s now Posh’s joint-top scorer with five goals. “Grant McCann told me that the Swindon goalkeeper had a possible weakness when receiving the ball at his feet so we worked on me closing him down at every opportunity,” Angol revealed. “He did like a trick or two, but luckily for me he messed that one up and I was able to score. “Obviously I’m delighted with five goals in six matches, but I’d be even happier if it was six goals in six games. “I don’t really think about the standard of football I’m playing. To me every game is just a game when I will try and score. I prefer to play right up front, but to come off defenders and run at them. “It’s been very easy to settle at Peterborough because the vibe is so positive. It’s a good place to be right now. “The management team is powerful and we have leaders like Gaby Zakuani in the playing squad. Gaby isn’t very vocal on the pitch, but he leads by example. Posh are eighth ahead of this Saturday’s (October 17) League One fixture at Port Vale.